Officer Brandon Brewer with Livingston Police Department at Subway, 200 Business 59, Livingston. Car Crashes Into Subway, LIVINGSTON, March 20, 2019 - At approximately 8:20 pm on March 20, 2019, a white 2012 Accura sedan, driven by Jewel Momayez, 71, of Livingston, pulled into the parking lot of Subway located at 200 Business 59. According to Momayez, she pulled up into a parking space directly in front of the store. When she pressed the brake, the car accelerated and she crashed through the front of the store. Momayez immediately put the car in reverse and backed out. Officers Donald Dyson, Brandon Brewer, and Sergeant Chad Ward with Livingston Police Department were dispatched to the scene. Trooper John Allen with the Texas Highway Patrol arrived to assist. Fortunately, nobody was injured. No citations have been issued as the accident remains under investigation. Momayez's vehicle was recovered by Ken's Towing and will be stored at Harrison Body Shop in Livingston. 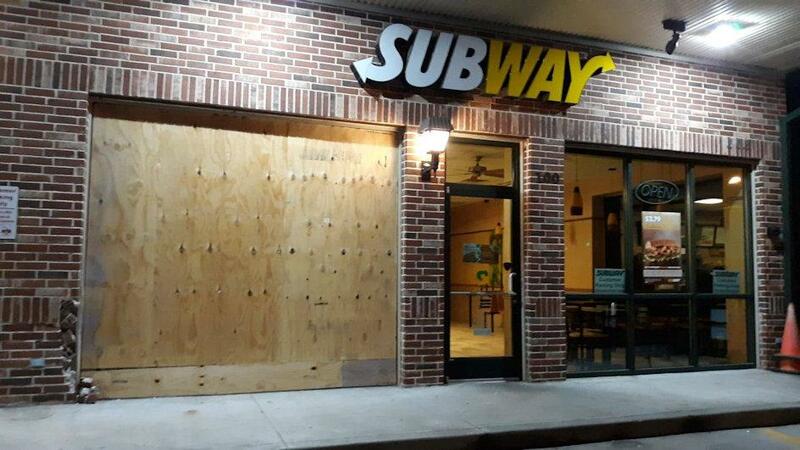 Subway Sandwiches, located at 200 Business 59 was the latest victim of a vehicle crashing into an established business. 71 year old Jewel Momayez was driving a 2012 Accura (pictured) and says that when she pressed the brake, the car accelerated. Momayez's vehicle was recovered by Ken's Towing. In less than 2 hours workers and the damaged store boarded up.